Where Russia’s hockey league goes, its bankers follow. Russian soft power is icy and camp. 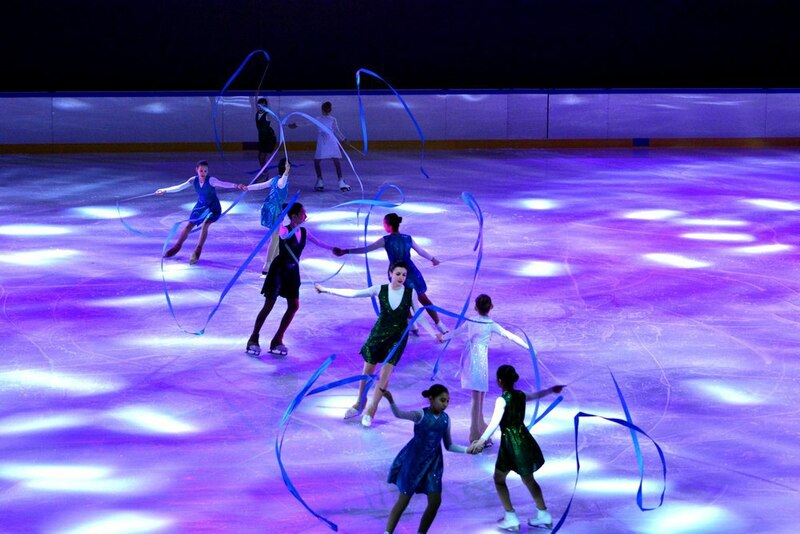 And it was on full display on March 15, at the inauguration of a spanking new $200 million ice sports arena in Uzbekistan’s capital, Tashkent. Uzbek President Shavkat Mirziyoyev, meanwhile, used the occasion to enthusiastically promote his latest hobby horse – physical fitness. Tashkent in March does not feel like a natural location for an ice rink. As attendants of the Humo Arena opening ceremony waited in unruly lines to pass through security control, they were assailed by a warm spring sun. Inside, however, the arena is the real deal – spacious, well-lit and equipped with smart, if not entirely completed, stands for VIP guests. Right until the last minute, cleaners in smocks were sweeping the floor with short-handled, old-fashioned brooms as repairmen bumbled around with ladders and tools to no evident effect. As Mirziyoyev was to give a speech, spectators were for reasons of security required to be in position for at least a couple of hours in advance. The president’s imminent actual arrival was anticipated by the crowd suddenly hushing in compliance with an unseen command. Minutes of silence were occasionally punctured by uncertain applause, each time seemingly triggered by an overeager sycophant. Mirziyoyev’s address was a mix of self-congratulation and optimistic exhortation. “Over the last two years, the number of people engaged in physical activity and sports has doubled,” he said. How this calculation was performed is anybody’s guess. In any event, Mirziyoyev wants more of this sort of thing. Expense is something of a sore point though. When sporting officials were earlier in the day asked by journalists about the cost of building the Humo Arena, they ducked. The price-tag of 175 million euros has been widely reported though. A handful of Russian hockey stars of yesteryear – including Pavel Bure, Vitaly Prokhorov and Valeri Kamensky – were enlisted to bring some sporting glamor to proceedings. At one stage, they came onto the ice in a pretend face-off against a team of Uzbek children, who celebrated putting pucks past the Russian goalie with genuinely unbridled jubilation. Although the Humo Arena is obviously a winter sports venue, inauguration ceremony organizers were evidently tasked with making the event a celebration of all disciplines. 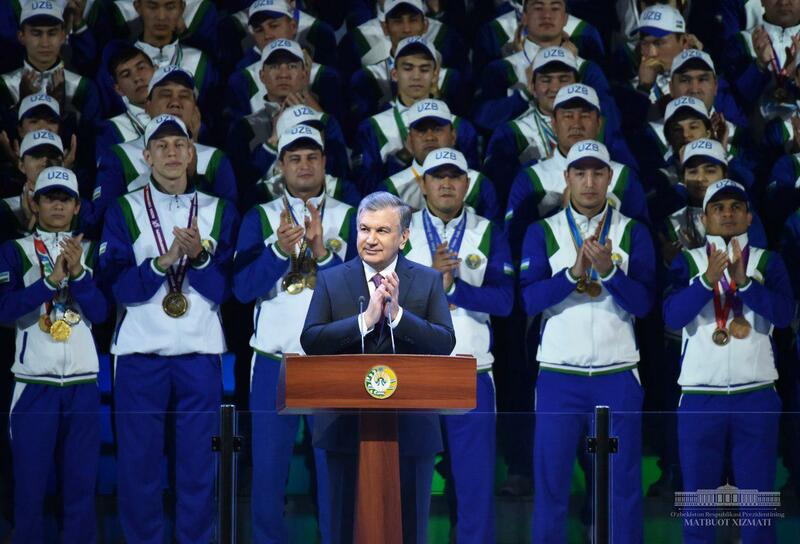 Following Mirziyoyev’s speech, the rink was transformed by an overhead projector into the simulacra of an Olympic swimming pool, which children shimmied across in imitation of swimmers. Next, a soccer field was beamed onto the ice, and again skaters did their part, punting around a ball. While the rink cycled through representations of various disciplines, from boxing to wrestling and figure skating to speed skating, more sporting shenanigans played out on the looming stage. There is talk that breakdancing will be included as an Olympic event by the 2024 Games, and it looks like Uzbekistan is already preparing for that eventuality. Para-athletes also got a showing, but they were confined inescapably to the top of the teetering steps at the back of the stage – an apt metaphor for how poorly Uzbekistan caters to the needs of the differently abled. With sports out of the way, it was the turn of The Nutcracker on ice. The harlequin in particular delighted the crowd with his alarming acrobatics. The highlight or lowlight – deciding which is a purely subjective matter – was the music concert that included turns from some of Russia’s most familiar celebrity performers. There was a pronounced whiff of Muscovite business-cultural diplomacy in the air, and not for nothing. 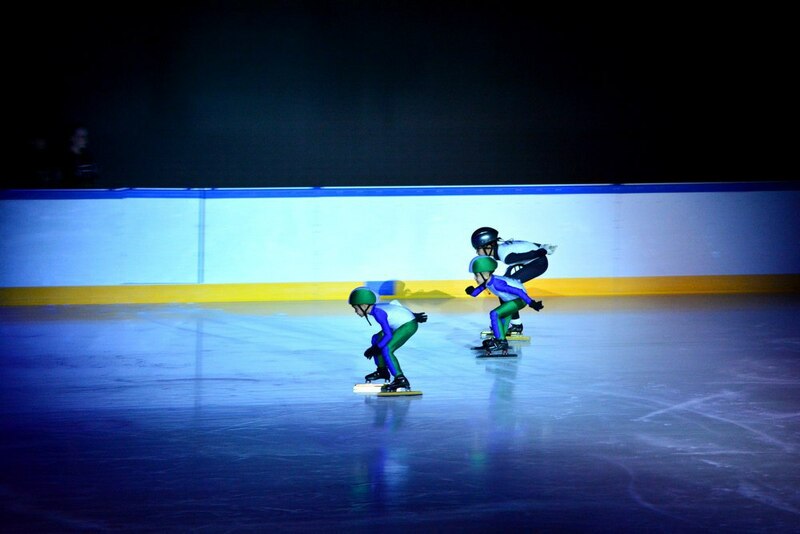 In March 2018, Uzbekistan set up a National Hockey Federation as part of an effort to revive the long-dormant sport. The leading financial sponsor for the sport is oil and gas industry services provider Eriell, which has Gazprombank as its main shareholder. Gazprombank is in turn one-third owned, and in effect controlled, by Russia’s state-run gas behemoth Gazprom. Eriell’s clients include the most famous names on Russia’s energy landscape, including Lukoil and Gazpromneft, both of which are investing significantly in Uzbekistan. The ultimate goal is to incorporate Tashkent hockey team Binokor into the Russia-dominated Kontinental Hockey League, or KHL, which also includes clubs from Belarus, China, Finland, Kazakhstan, Latvia and Slovakia. Hockey fans in Russia, like the unnamed blogger who wrote a piece about this prospect on sports.ru as early as November 2017, are decidedly sniffy. In any case, while Putin did not turn up for the opening of the Humo Arena, Philipp Kirkorov did. Kirkorov’s turn was followed by fellow crowd-pleasers Nikolai Baskov, a ferociously cheerful crooner sometimes dubbed the “Golden Voice of Russia,” and Dima Bilan, winner of the Eurovision song contest in 2009. Bilan, who can normally be relied upon for some energetic dancing, managed only to hobble about the stage on account of a badly broken leg. The audience did not appear to care, however, and excited shrieks rung around the arena. For all Russia’s compromised stature on the global stage, there are many places in the world where the wattage of its stars remains undimmed. Peter Leonard is Eurasianet’s Central Asia editor.